The Shalimar Spice Garden Resort is a wonderful hotel in Kerala at Thekkady. It has an outstanding facility, services and attraction points. Read here about Facilities, services and contact address of Shalimar Spice Garden Resort. The Shalimar Garden Resort comes with the dense garden tropical canopy were the fragrances of spices wafts gently down, chirping of birds and gurgle of crystal clear mountain stream gives us immense pleasure. The Shalimar comes with Flora and fauna mesmerizing beauty as the sunlight filtering through trees gives an relaxing natures breeze. It is on the Western Ghats mountain ranges of Kerala. The Nature retreat nonpareil where you can relax and rejuvenate completely. Shalimar comes with the multi cuisine restaurant with good in quality of food and provided best services by the faculties are simple enjoyable in Shalimar. Maria Angela Ferncof and Shaji Antony who were exchanged their cultural idea sand and worked together to build the Shalimar Beach Resort which now gives immense pleasure to the holiday visitors. 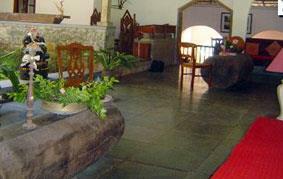 This Shalimar Garden Resort is mostly liked by many peoples and it is fully furnished with great values. The Interior and exterior are good enough. Here in Thirusangu haven we can have an Ayurveda therapy in lake view Dining room for families who can chat over there and enjoy for whole night. The Thirusangu haven is mostly liked by Honeymooners. Car Hiring is also available for guest to visit some tourist spots around the Shalimar Garden Resort Doctor-on-call facility also available for guests. Here everything is in traditional and village style that admires most of the Guest to drive in for Shalimar Garden Resort Trekking. The Shalimar Garden Resort is got with its natural beauty over the lake and the views are fascinating for everyone who wants to admire Kerala. Here Many facilities are available for guests with moderate cost and guest can experience a pleasure full atmosphere overall in the Shalimar Garden Resort. Overall the views captured here are most memorable and can able to hide it from others. Many tourist spots and The Shalimar Garden Resort is also loved by Honeymooners. People will be surely like this place if they visit. The atmosphere overall tends every people to come again and again without fail and they are not able to leave the place that much easily. Here there is a boating in the famous Periyar Lake is very enjoyable and you will spot wildlife sanctuaries on either side as you cruise along. Ammatchy Kottaram is an ancient summer palace built by the Maharaja of Travancore in traditional Nallukettu Style. The Exotic Mangaladevi temple and The Pallikannu which is the 18 Th century British Church is also located very nearer to the Shalimar Garden Resort. These are some of the sightseeing areas in and around Shalimar Garden Resort.